At the end of every year, I have to marvel. It seems that the year has simultaneously flown by and dragged by. At certain points during the year, it seems that there is no end in sight to the papers to grade, the tests to administer, the students to service and the parents to conference with. At other times, I wonder how I'll find the time to fit in all the learning and fun I need to. But, at the end of the year, I need to reflect on how the year went, and really celebrate the successes- that's why we are here, right? Plus, remembering to focus on the successes and not the less-than-successes (I don't like to think of them as failures), helps me to prepare mentally and emotionally for next year. 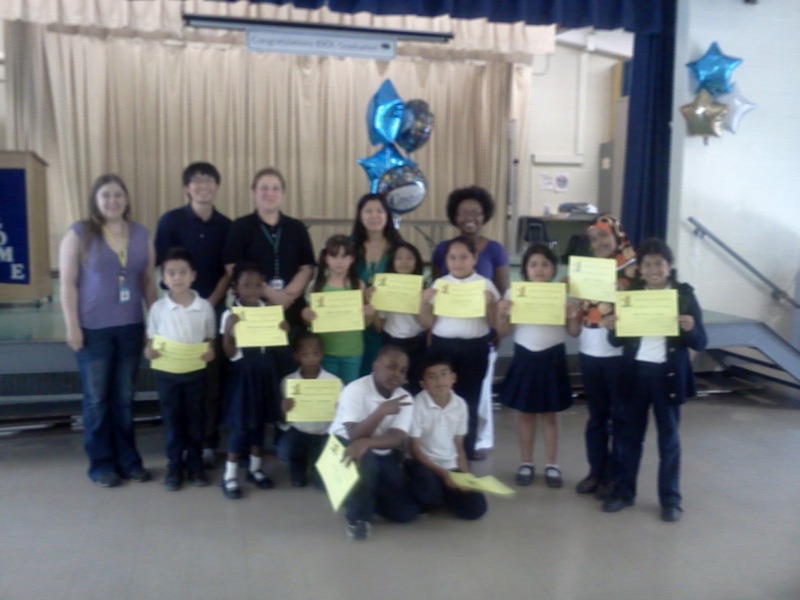 This year, our ESOL program was able to exit 15 of our students- 5 of them are mine! This year the state switched over to the WiDA Access test. It was not new to me since that was what we used in North Carolina, but it was new to my students and new to the other teachers in the building. It is much more difficult that the last English Language Proficiency test used by Maryland (LAS Links) and had much more of a focus on academic language. On the last day of school, we held a small celebration for our ESOL Graduates with cupcakes and certificates. The kids were thrilled. Here's a photo of all 5 ESOL teachers with our graduates. I'm in the purple on the end. I know it is blurry, but that is for safety reasons! When I told one little girl that she did so well on the test that she had exited she immediately got a huge smile on her face and hugged me, then it seemed to immediately dawn on her that it also meant no more ESOL classes- and her face fell and she said "Oh no!". It touches my heart that my students so love to come to my class. Another success is that this has been my first full year with my current district. I came in at the beginning of April last year. The ESOL team at my school is excellent- I'm very lucky. We all get a long well and work well together- and we all try to do what we think is best for our students. I left a toxic situation in a toxic district to come here, so I am pleased that the grass has indeed been greener. Additionally, I have done a WiDA presentation for the district, and will do more next year, in addition to the professional development course I will teach next year on ELL Strategies for mainstream teachers. I love working with teachers as much as I love working with students, so I'm very excited about that. It feels that my current district appreciates me, and my career can go somewhere. I can count about 100 other successes, large and small, throughout the year, but I won't bore you with that! These are the top few that have stuck out in my mind. I hope you take time to push aside the less-than-successes (after using them to help you grow as a teacher) and reflect on the successes that you had this year!